I am so excited for this unit! It revolves around the movie "Ocho Apellidos Catalanes" (which may or may not be appropriate for your school; I will definitely skip some parts). 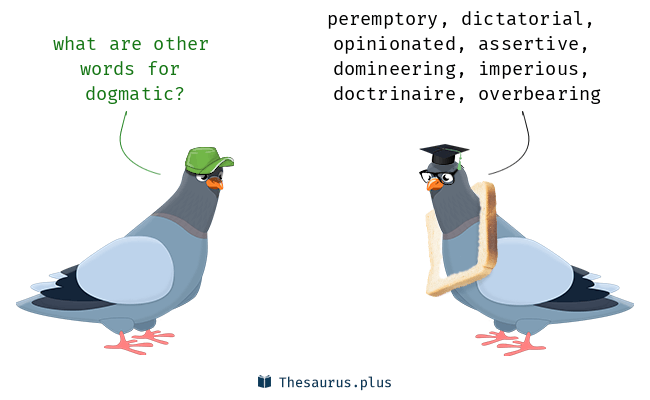 Cataluña has been in the news a lot lately and this will help students to understand it a bit more. The movie is a romantic comedy and is very engaging with some funny characters. I, along with a little some crowd sourcing help from Isabel Irizarry (@profe_irizarry), have comprehensified the movie so that students can read about it before and then watch in Spanish with Spanish subtitles. 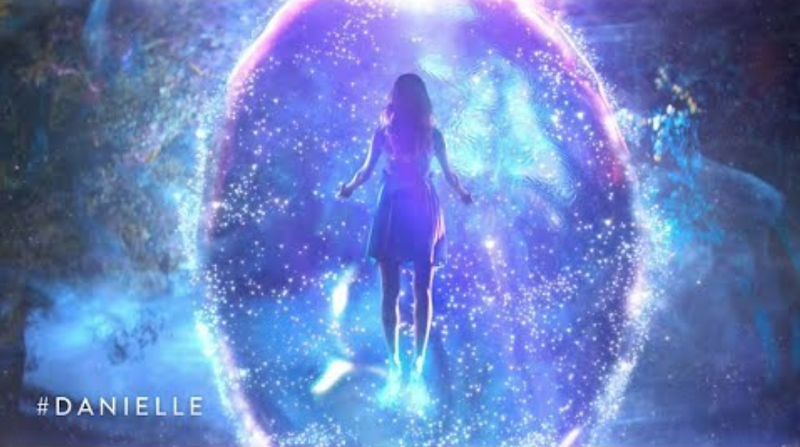 We will probably spend about 5 days watching the movie. I have created some different assessments for students to show their learning and reflections. The activities that they do leading up to watching the movie will be fun, engaging, and make them think about stereotypes. You can find the unit packet here (for free) or, if you use Google Classroom, you can find it dividided into parts here. Identifica, explica, y empareja algunos productos, prácticas, y perspectivas culturales de ciertas comunidades autónomas de España. Compara y contrasta dos estereotipos/tópicos de España con dos de New Hampshire y/o los Estados Unidos. Reacciona, explora, y/o muestra lo que aprendiste de la película "Ocho Apellidos Catalanes"
Update: Click here. Or you can buy the Danielle resources here. 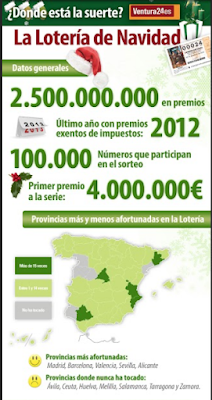 Have you seen the new anuncio for the Lotería de Navidad? It is a long one, but I love it. Like Carmina and Justino, it is a bit sad at times, but overall full of joy, hope and love! I am going to add this "story" to my Lotería de Navidad unit, a unit that my students absolutely LOVED last year. You can purchase them here or I have added these Danielle resources to the Carmina TPT, so if you bought that, you should re-download it to get full access to the presentation and the doc. I will be adding a lot more soon and selling it separately soon! Have you seen the video Pescaíto by Carlos Vives? I love it! I (and some of my Spanish 3 students) might be a bit obsessed with Carlos Vives lately! His music is really good and appropriate! If you want to make it a song of the week, here is a doc with a cloze activity and a "translate some lines" activity for the song. I really wanted to comprehensify and extend this authentic resource. So, I created an entire story unit based around the song. The story is called "El Día Perfecto de Carlos Vives"and you can see it in the slideshow below. The words in italics are song lyrics and/or words from the song, so when students hear the song, they will already know many words. The unit will help students to understand and communicate about what they and others would do. And they will also learn about Colombia a bit. Below is the slideshow (without links to the unit packet and cultural readings to extend the unit). If you want more, click here (link to TPT) and see below for what the unit includes. Click here if you want to make a copy of the slideshow and adapt it. If you feel like this is something useful, it saved you some time, and you want to give back, click here. The unit packet has a ton of links and activities to comprehensify and extend the song/video! Here are some more details about the unit, what it includes and a possible order for the unit. This unit is for late Spanish 2 and above. If your students have not heard of Carlos Vives (a famous Colombian singer), they might not be as enthusiastic about this unit. Before this unit, my students did two story units based on songs by him: “Robarte un beso” and “La Bicicleta”. Carlos Vives sings “La Bicicleta” with Shakira, so that might help to show your students how famous he is. This story unit focuses on exposing students to the conditional tense and acquiring some verbs in the conditional so that they are able to say what they and others would do. In addition to a focus on the conditional, the unit is also wrapped around the song and video "Pescaíto" by Carlos Vives. The description of Carlos Vives' "día perfecto" is written using in the yo form (from Carlos Vives’ perspective) with vocabulary from the song and is illustrated with screenshots from the music video. The presentation (linked in the unit packet with links to all readings, etc) will walk you through the unit. I have not divided this into days because I teach 85 minute classes and some people teach 45, 50, or 60, but here are some other suggestions for a possible order of the unit. Introduce the Essential Questions, Metas, and the Evaluaciones for the unit. Briefly explain conditional tense (slide in presentation). I do not recommend focusing on this too much or having students take notes. They will acquire it through the repetition in the unit. A blank vocabulary sheet where students can fill in words as they go through the unit. They could also make a Quizlet with those words. Do the "Cuatro Esquinas" activity to activate what students would do on their "día perfecto". Use the presentation to tell the story of "El Día Perfecto de Carlos Vives." Possibly use Flipgrid to do the Interpersonal Speaking evaluación with the personalized questions. OR just use those to have conversations with the class throughout. Do the Quizlet Live activity for parte 1 to give more repetition and CI to students. Continue the parte 2 of the story and do the same. Do the cloze activity with the song. Listen and try to sing the song everyday throughout the unit. Have students reread the story and illustrate it. Do the translations from the song. Do some of the cultural readings throughout the telling of the story. The readings are linked throughout the presentation. Play "Agárralo" in pairs. Each pair has a pen/pencil/marker between them. I say cierto or falso sentences about the story. Students have to grab a pen/pencil/marker if the sentence is true. The first person to grab it, earns one point. If a student grabs it when I say a false statement, s/he loses two points. This is a fun game! Have students do the matching activity about the cultural readings from the video. 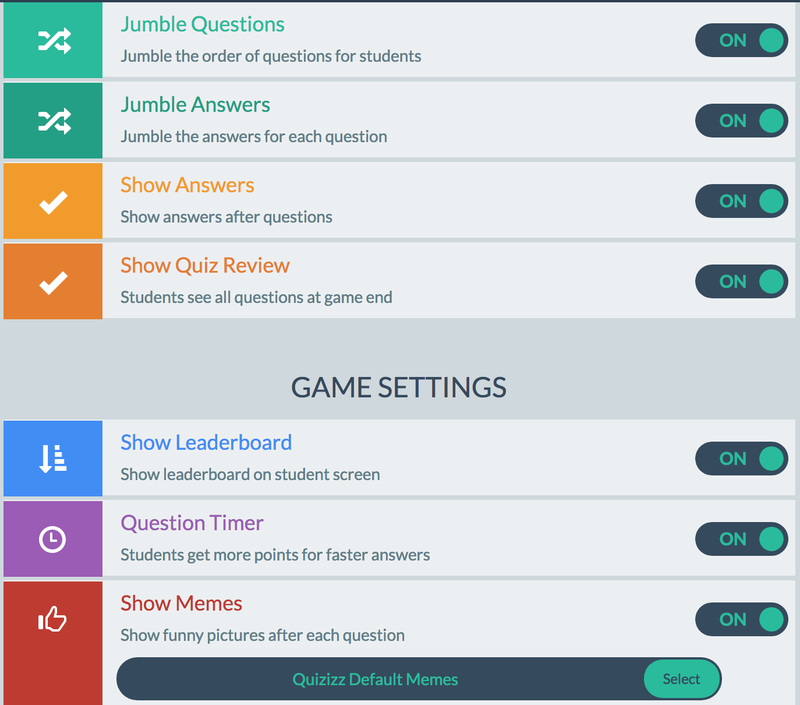 Do the Quizizz activity as an in class activity, a homework, and/or a quiz. Students can do this activity more than once. Play Backatcha. This game is a great way to get students speaking spontaneously! Have students do the Presentational Speaking Assessment - Prepare and present what they would do on their "día perfecto". This can be done in groups of four and recorded on Flipgrid. There is a description of this assignment and a rubric at the end of the packet. Have students do the Presentational Writing Assessment - Identify the cultural Ps in the video "Pescaíto" and compare them to your own. ¿Cuáles son las partes que más adoro de mi comunidad? ¿Por qué son importantes para mí? ¿Cuáles son unos productos, prácticas, y perspectivas culturales que se ven el el video "Pescaíto"? ¿Cómo son similares y/o diferentes unos productos, prácticas, y perspectivas culturales que se ven el el video para "Pescaíto" con los míos? I can talk about what I would and/or would not do on my "perfect day". I can interpret a story about someone's perfect day. I can compare what I would do on my "perfect day" to what someone else would do. I can answer questions about what I would do on my perfect day. I can identify and describe some cultural products, practices, and perspectives of the neighborhood Pescaíto in the city Santa Marta, Colombia. Interpersonal Speaking (on Flipgrid): Answer personalized questions (sprinkled in the presentation) related to the story: "El día perfecto de Carlos Vives". OR This could also be Interpersonal Writing and students could write answers during the presentation. Interpretive Reading/Listening: Answer questions about the story: "El día perfecto de Carlos Vives"
Cultural Comparisons/Connections: Identify the cultural Ps in the video "Pescaíto" and compare them to your own. Students love Kahoot... but are they a little Kahooted out?!? Quizizz is a great alternative! I love Kahoot too. 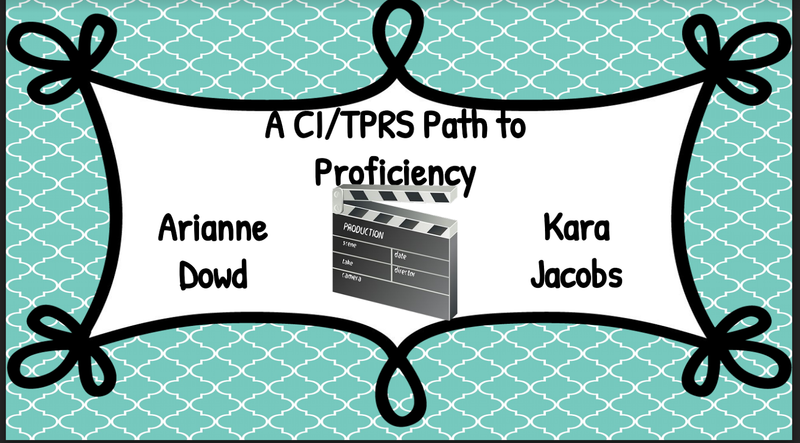 It is great to give more CI and for formative assessments. Quizizz is very similar to Kahoot, but students can go at their own speed ----> easy differentiation! They are competing against each other, but at their own speed because the questions and answers are on their screens, not projected like Kahoot. Students can take their time to read, process, and answer questions. Also, you can do a variety of things with the settings, like turn off the "leaderboard," which makes students slow down. I also like to jumble the answers, usually not the questions because they are sometimes in order of the story. I created a Quizizz for Arianne Dowd's "La Bicicleta" story (based on the song/video for the Shakira and Carlos Vives song). You can find the story on a free slideshow here (highly recommend the whole unit: example of Essential Questions and "I cans" here!). I will use this to give students more CI in a fun and engaging way. During MaFLA, Arianne and I said that we would create a blogpost to review what we shared and to share a few things that people asked about, so here it is! I wanted to make a key point about why we use stories (in the form of music videos, cortometrajes, películas, and/or novelas) as the anchor for units. Using stories allows us to do the following things: give Comprehensible Input, engage our students, easily differentiate, focus on communication (not grammar), and embed culture easily in the curriculum. And all of those things lead to LANGUAGE ACQUISITION. ¿Quién lo dijo? ¿Quién lo hizo? And a new idea from Arianne's colleague, ¿Quién lo pensó? Spoons from Martina Bex - fun! Pre-reading activity called Musical Milling is one I learned from TOY Nicole Naditz. Take pieces of text from reading and put them on cards. Then play music. Students walked around the class and read sentences to each other and try to remember vocabulary or chunks. Then get back into groups and made a list of what they can remember. Then students make predictions about what the text would be about. Makes reading so much more exciting. Predictions on Flipgrid - so fun! I need to go back in and listen the ones that were made about Abuela Grillo. Use slide with lots of pics to ask questions, listen and identify pic, cierto/falso, make predictions, etcs. EDpuzzle - not sure if we mentioned this, but here is some more information. Ohio Rubrics! These are amazing for the three modes of communication. El Seminario Socrático with an interpersonal twist. MaFLA attendees to our workshop, if you need any more resources, let me know and I will share more! Also, Arianne and I both have Facebook pages for our blogs/TPT stores: Arianne and me. 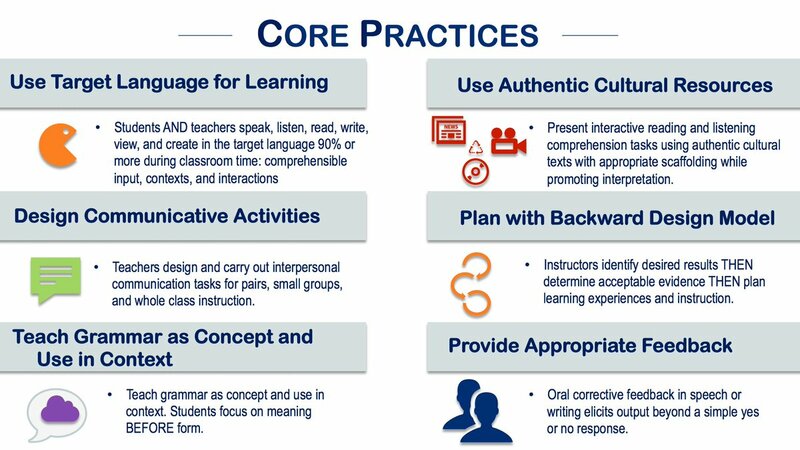 Using stories also helps us to use the ACTFL Core Practices. I hope to have some blog posts soon about how we can do this with CI and stories.